Congratulations to "Sherry G.", the winner of Laura and Allison's giveaway. Thank you to all who particpated! 1.) How did you and Allison decide to collaborate? Laura: I’ve always loved bouncing story ideas around with Allison. She’s great at thinking in new directions. For years we’ve talked about collaborating on a project together and when the idea of this detective duo came up we were both very excited about it. The ideas were flying back and forth and I knew we were going to write these characters. Allison: What Laura said. And I'll add that my mom was a big supporter of the idea! When I told her that Laura and I were thinking of writing a book together, she said our voices would complement each other. Since she's read all my books, and all Laura's books, she definitely knows best! 2.) What is the inspiration behind the idea of two LAPD cops opening their own detective agency? Allison: When we started talking, we immediately knew we wanted to write female PIs. There are a lot of buddy books with guys, but few with two strong female leads (Tess Gerritsen's Rizzoli & Isles is one.) Then it was a matter of figuring out why they were friends, why they trusted each other, what their backstories were. Laura: We both love to write law enforcement characters. Moreno and Hart start out with LAPD, Scarlet Moreno as a detective and Krista Hart as a rookie cop. A shooting incident derails their careers, and they are forced to re-invent themselves. When they become PIs, they have all that law enforcement experience to draw on, but now they also have much more freedom to bend the rules. 3.) Does this have the potential to become a series? Allison: Absolutely. The prologue we wrote gives readers the background as to how Scarlet and Krista came to trust each other, which was important to the foundation of each of our stories. But it also opens up questions that I want to answer in future stories. Plus, I really like our characters and want to see what happens with them and their respective love interests! Laura: Definitely need to see what happens with the love interests! I, for one, want my character Krista to see where things go with rival investigator R.J. Flynn. 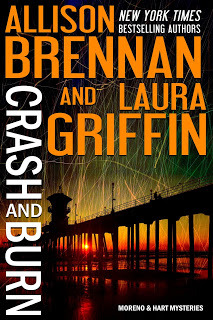 CRASH AND BURN kicks off Moreno & Hart’s story, but there is much more to tell. We would love to give away a free CRASH AND BURN eBook to someone who comments on the blog. Thank you so much! We hope you'll like CRASH AND BURN. Thank you so much! I love Laura, too. She is uber talented! I am looking forward to reading this book. I have read books by both authors and enjoyed them. Sign me up! And please make this a series!! I'm a big fan of female detective stories and who better to create two new ones than two of my go-to authors. This is great news. I love detective stories, too, and this was fun to write. Thanks for reading. Oooh, I love the idea of two females opening up their on PI Agency. I have yet to read either of your books but have seen your names around the the book world, so perhaps this is a great wait to be introduced to both of your writing. Congrats and best of luck with it! Wow, 2 of my favorite authors collaborating. I look forward to reading this one! Congrats on the new release, ladies. Alex from "Untraceable" is one of my favorite PI heroines. I really enjoy Allison's Lucy Kincaid series. Laura Griffin sounds like an author I definitely have to check out. This book sounds like one I will be reading soon. Two of my favorite authors! Would love to win. Allison Brennan is one of my absolute favorite authors. I love her books! I will definitely look into Laura's books now. Can't wait for this release! they are both top notch writers and I look forward to see the results of their working together! Excited! Two Fab authors in one book! What a fabulous collaboration. This is very exciting for us as readers. I have always follow Allison Brennan and Laura Griffin. Now that they have collaborated on Crash and Burn, it is a dream come true. I have always wonder if Allison and Laura will ever considered collaborating together. Thanks Allison and Laura. What a great team. Looking forward to reading the stories. Love both ytour books & have most on my bookshelf. Adding more slowly. Thanks for writing what I love to read! I look forward to read the book from two collaborating great authors! I had the chance to read "The Glass Sister" series, by Laura, a while ago, and do I need to say I simply could't put them down? Thank you to both Allison and Laura! Would love to read the book...sounds like my kind of book! Need some new authors. Thank you for the opportunity and good luck to all! Email address is bonlyn55@yahoo.com. I like the two strong female leads. It reminds me of Cagney and Lacey. Love both of our books. This book sounds great!